THIS CONCERT HAS BEEN CANCELED. Mitch Paliga is an active performer, educator and composer based in the Chicago area. He has been touring with actor/musician Gary Sinise's Lt. Dan Band since 2007. As a member of the Lt. Dan Band, he has performed in Afghanistan, South Korea, Japan, Kuwait, Europe and Canada as well as throughout the U.S., averaging 40 shows a year. In 2008 he performed with the band Kimotion at the Ho Chi Minh Conservatory of Music and the Hue Festival in Vietnam. He has also performed with Vinnie Colaiuta, Christopher Cross, Danny Gottlieb, Jeff "Skunk" Baxter, California Transit Authority (Danny Seraphine and Bill Champlin), Steve Rodby, the Nelson Riddle Orchestra, and many others. Mitch has two recordings under his own name, Blithe Moments and Fall Night, both on the Origin label. 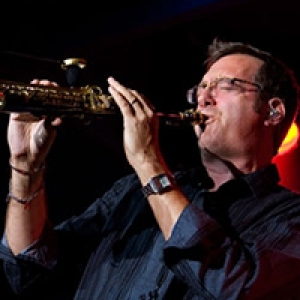 He has recorded over 30 original compositions and arrangements with a variety of artists, and is a founding member of the Chicago Jazz Composers Collective. Mitch has a Master's Degree in jazz pedagogy from Northwestern University and a Bachelor's Degree in music from Eastern New Mexico University. In 1993, he received a National Endowment of the Arts grant for individual study with master jazz musician David Liebman. In 2002 he received a City of Chicago Community Arts Assistance Program Grant. Mitch Paliga endorses AMT Microphones and is a D'Addario Reed artist.